I came to Denmark in November 2000 to work as a research assistant with the Alzheimer’s research group at Aarhus University. After spending 14 months with that group I decided to get myself enrolled as a PhD student at the University. I was in touch with Dr. Suresh Rattan who was doing extensive research in the field of ageing. Because I came from ‘human genetics’ background, Dr. Rattan (who later became my PhD co-supervisor) proposed that I write a project where I combine the fields of ‘ageing’ and ‘human genetics’. Dr. Steen Kølvraa, who was based at the Department of Human Genetics, agreed to supervise my PhD, and I wrote a proposal to study the association of HSP70 genes with human longevity and survival. Human longevity is a multifactorial trait, meaning that there are many factors, both genetic and environmental, that determine how long a person is going to live. We now know that around 25% of how long we are going to live is determined by the types of genetic variations that we carry. Hence pinpointing those genetic variations that can provide a survival advantage, and then understanding what those genetic variations do at the protein level to give us that survival advantage, can go a long way in deciding future interventions. Hsp70 proteins, also called ‘stress proteins’, are involved in cellular and molecular repair and other defense mechanisms and help the cells to respond to stress. And this ability to respond to stress decreases with age. Hence we proposed that different variants of HSP70 genes will have different ability to cope with stress and in turn be associated with survival potential of an individual. A series of gene-association studies were planned where the distribution of gene variants was studied between young and old individuals. An over-representation of a gene variant in the older population would reflect the survival advantage associated with that gene variant. Our research showed that some HSP70 genes variants were positively associated with human survival and the ability to respond to stress at the cellular level. 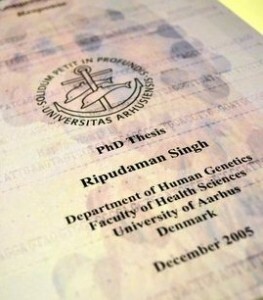 My PhD work was done in association with the Department of Molecular Medicine at Aarhus University where my second co-supervisor, Dr. Peter Bross was based, and the Department of Epidemiology, Biostatistics and Biodemography at Syddansk University, which has one of the largest and oldest twin registries in the world. They also have good collection of samples from centenarians and long lived individuals. The results from the PhD were published in 5 peer reviewed journals.